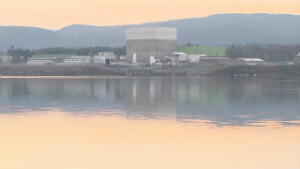 (CNN) -- As the United States prepares to build its first new nuclear power reactors in three decades, concerns about an early generation of plants have resurfaced since last year's disaster in Japan. The Vermont Yankee nuclear power plant -- the subject of a battle between state authorities and the Nuclear Regulatory Commission over its continued operation -- uses one of 23 U.S. reactors built with a General Electric-designed containment housing known as the Mark I. It's the same design that was used at Japan's Fukushima Daiichi nuclear power plant, where three reactors melted down after the station was struck by the tsunami that followed Japan's historic earthquake in March 2011. The disaster resulted in the widespread release of radioactive contamination that forced more than 100,000 people from their homes. GE says the Mark I design has operated safely for more than 40 years and has been modified periodically to meet changing regulations. No nuclear plant could have avoided a meltdown after being swamped by a tsunami and losing power to cooling systems for an extended period of time, the company says -- and at least one expert CNN spoke to agrees. But concerns about the Mark I's ability to contain the consequences of a severe accident have been raised for decades, and critics say the Fukushima Daiichi accident shows it can't survive a real-world disaster. The structure was designed so steam that builds up in an overheating reactor can be diverted into a doughnut-shaped water tank known as the suppression pool, or torus, where it condenses back to water to reduce pressure inside the reactor containment building. That allows utilities to build a much smaller containment structure -- as little as one-sixth the size of those used at some U.S. plants. Stephen Hanauer, a former top safety official at what was then the Atomic Energy Commission, warned in 1971 that in an accident in which the core slowly loses coolant and overheats, the Mark I containment "would overpressurize. That could lose the torus water source, hence ECCS [emergency core cooling system] as well as leak out fission products." Bergeron called the Mark I containment the smallest and weakest of those used in American plants. But he said the NRC "punted" in the face of industry resistance by calling only for utilities to install vents. As for GE, he said, "They got the rule book from the federal government, and they said 'This is all you have to design it for.' The real question is: What should have been done after 1979, when you found out the rule book was flawed?"